You may be surprised to find yourself branded as one of the bad guys for believing in Israel, its right to exist and its place in God's future purposes. How does this come about? Here are some case studies on influential organizations, publications and schools of thought which brand themselves "Christian" or moral but which condemn and vilify Israel. The author has attempted to analyze their methods with a view to helping folk understand what they are doing in order not to be wrong footed by it. You are encouraged to analyze the assertions of Anti-Israel activists rather than accept their "facts". Avoid feeling obliged to answer their questions, when in many cases the questions themselves are the vehicle for their campaign. When they ask the wrong question, counter with the question we should be asking. When Joshua and the elders of Israel were confronted by the Gibeonites with their mouldy bread and worn out sandals they responded to the information presented to them. Joshua 9 v14 says, "The men of Israel sampled their provisions but did not inquire of the LORD. Then Joshua made a treaty of peace with them to let them live, and the leaders of the assembly ratified it by oath." We should not take challenges at face value and be tricked into responses God would not want. You may be even more surprised to be branded as evil and misguided by sincere Christian speakers at Christian conferences. You might agree that the story of Balaam is relevant to this page. The World Churches Council (WCC) has chosen Jordan to launch an international initiative that calls on international churches to put an end for Israeli occupation of the Palestinian and Arab lands to reach just and comprehensive peace in the region. Choosing Jordan, conferees said, was because of the WCC confidence in the initiatives of His Majesty King Abdullah II, which they described as "precursor in seeking to achieve peace in the Middle East". This was announced during the World Council of Churches International Peace Conference, which kicked off today in Amman. The conference aims to call all churches and related organizations to work hardly and put an end for the Israeli occupation of the Palestinian and Arab lands, according to the General Secretary of the WCC Samuel Kobia. Kobia highlighted importance of ending the Palestinian-Israeli conflict according to the international legitimacy resolutions. Why does the WCC choose to meet in Amman Jordan rather than Jerusalem, city of our God? How does the WCC justify propagating the Humanist political worldview rather than the Bible worldview and seeking a secular political solution instead of God's will? When did the WCC become an arm of the UN? Where did WCC pick up their terminology? WCC claims to be representing millions of Christians - do you have any say in their agenda? Is WCC representing you in its pronouncements? The Ecumenical Accompaniment Programme in Palestine and Israel is, effectively, the outreach arm of the WCC to spread their anti-Israel message around the churches by visiting and recounting their stories and activism in the West Bank. For instance, the Wednesday morning club in our church was recently addressed by Stan Rowe of Hereford on, "The Trouble with Jerusalem." This sounds innoccuous enough, just a local man telling his story, he doesn't appear in a Google search. When he arrived we found out that he represents EAPPI and came to share his loathing for Israel and recount all the Palestinian lies about Israel. Although they speak of "Palestinians and Israelis working together for peace" and "peaceful resolution to the Israeli/Palestinian conflict " Their baseline assumptions are revealed by their use of "under occupation" and "international law" and UN resolutions" All of these terms refer to the Palestinian narrative version of history, the Palestinian version of International Law and of UN Resolutions. It must also be remembered that the United Nations is not God's arbiter of international affairs but a heavily biased worldly pressure group. Their forthcoming World Week for Peace in Palestine Israel is to encourage concerned communities and individuals to make a common witness by participating in worship, educational events and acts of advocacy in support of a just peace for Palestinians and Israelis. sounds laudable and will doubtless recruit plenty of Christians to pray against Israel. But, if they seek a just peace for Palestinians and Israelis, why do they show no concern for the suffering and terrorism suffered by the Israelis? Who pays their activists to go to the disputed territories and bring back their tales to their local churches? Is it the churches that support Christian Aid and related organisations? More than 100 church-based relief and development organisations worldwide, including Christian Aid in the UK, have formally united under an umbrella group. ACT Alliance, created through the leadership of the World Council of Churches. The "Christian" community that is working against Israel is highly professional, highly organised and very well funded. But Christians who believe that Israel not only has a right to exist but is part of God's plan for completing world salvation are largely enthusiastic amateur individuals. Seeing all the recent advertising campaign for Christian Aid Week on TV, posters, buses and everywhere, have you wondered how much of your money is spent on advertising, misguided political activism and how much actually finds its way to acts of charity in the name of Jesus? Christian Aid’s activities date back to the 1940s. The organization operates in more than 50 countries and is heavily subsidized by the British, Irish, Scottish, U.S., Norwegian, and EU governments. Serves as the official relief, development and advocacy agency of 41 sponsoring churches in Britain and Ireland, and is part of the worldwide church community. Funding: 2012/13 income of £94,445 million. Christian Aid gave 361,839 CHF in 2010 and 224,957 in 2011, and CHF 297,258 in 2012 to the World Council of Churches (WCC). WCC plays a key role in mobilizing the church BDS effort globally. Received £14.5 million from the Department for International Development (DFID- UK Aid) in 2015. Political Advocacy: Assumes a highly biased and politicized approach to the Arab-Israeli conflict. Its publications systematically ignore Palestinian responsibility in the conflict and minimize Israel’s right to self-defense. Partner organizations include some of the most radical NGOs operating in the region: Sabeel, Zochrot, Israeli Coalition Against House Demolitions (ICAHD), Adalah, Palestinian Centre for Human Rights (PCHR), Palestinian Agricultural Relief Committees (PARC), Physicians for Human Rights - Israel (PHR-I), Alternative Information Center (AIC), and the Ecumenical Accompaniment Programme in Palestine and Israel (EAPPI). Contributed to the 2013 Zochrot conference, “From Truth to Redress: Realizing the Return of Palestinian Refugees.” Insisting on a “right of return” for 1948 Palestinian refugees and their millions of descendants amounts to a call for the elimination of Israel as the nation-state of the Jewish people. On October 30, 2012, twenty-two NGOs, including Christian Aid, released a report, “Trading Away Peace: How Europe Helps Sustain Illegal Israeli Settlements.” The report repeats the BDS (boycotts, divestment, sanctions) agenda, calling on the EU and national governments to wage political warfare through various forms of economic sanctions on Israel. In June 2011, Christian Aid published “Locked Out: Palestinian Refugees and the Key to Peace,” a biased report demanding that Israel accept Palestinian positions solely based on the Palestinian narrative and refugee claims. There is no parallel call on the Palestinians to acknowledge Israeli claims and no recognition of the need for mutual compromise. In June 2012 Christian Aid issued a call for legislation to ban the import of goods to the UK from Israeli settlements. At the Methodist Conference in July 2012 a motion was passed supporting this call. In November 2012, Christian Aid, in partnership with the North East Ecumenical Accompaniers, CAFOD, Friends of Sabeel UK, and others, organized a conference on Peace and Justice in the Holy Land that took place in Gateshead, England. The conference relied exclusively on the Palestinian narrative and absolved Palestinians from any responsibility in the conflict. This magazine gives a flavour of Christian Aid's Anti Israel fervour. 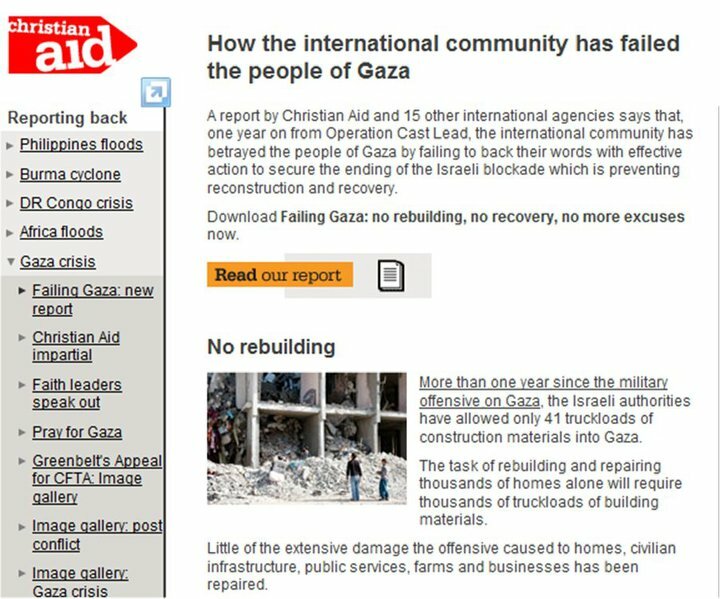 Christian Aid has been running a long campaign against Israel, wholeheartedly propagating the Palestinian Authority version of events. The Autumn 2004 magazine was a particularly blatant example of its obsession with Israel. Of its 24 pages, the following all referred to the campaign against Israel. Picture of man in kafir and boys, one in Santa outfit (Palestinians) - Heading "Children of Bethlehem". Linking Christmas to the Palestinian cause, set forth within. About Jessica, a child casualty of a gunfight "between Israeli soldiers and local youths" (terrorists one assumes if they were armed and shooting at the IDF) "The newly built security barrier makes it difficult to get to hospital appointments in Jerusalem." page 4 - News "End of the road for Two State Solution"
"A new Christian Aid report has criticized the international community for failing to curb illegal Israeli activity on Palestinian land. This is not news - it is repeating their own opinions, which are entirely one sided and unsubstantiated. page 12 - Feature article "Child of Bethlehem"
"Jessica Safar is a Palestinian Christian . . . Bethlehem is a difficult town . . The separation barrier all but cuts off . ." etc. (There is no mention of the major source of misery for Bethlehem Christians – Muslim persecution that has reduced them from a majority to a 10% minority, summary executions of suspected collaborators (those not supporting terror) and the commandeering of Christian homes and churches from which to attack Jewish neighbourhoods and IDF patrols so that the effects of returned fire can be shown to the world media.) In the tirade against the barrier there is no explanation of why it was built. The article complains that the people "can not get to their work in Jerusalem" and the article concludes with, "The wall will end us. It will put us all in a big jail" (This defies logic, since the Palestinians (and Christian Aid) objective is a two state solution, which will permanently separate Israel and the new Palestinian state.) We are told the Jessica’s family has to live on less than £35 per week. (the poverty is a result of the Intifada - not Israeli repression). We are told Jessica has difficulty getting to hospital appointments in Jerusalem. (Why is she not being treated in a Palestinian hospital?) ( Christian Aid gives no credit to Israeli medics who treat many Palestinian children free of charge.) "Jessica’s family cannot get to Jerusalem to celebrate Christmas." (Why would they want to go to Jerusalem from Bethlehem?! ) In a photograph on page 14, Jessica is posed in front of a section of wall, covering her glass eye and dressed in a jumper bearing the lettering "LOVE" (in English?) and wearing two crosses. "Essential background" (end panel) offers copies of the CA report on the crisis in the "Occupied Territories"
One letter pointing out Arafat's responsibility is shouted down by a bold print reply from Baroness Williams and three other letters, backing her assertions against Israel while advancing no reasoned arguments. 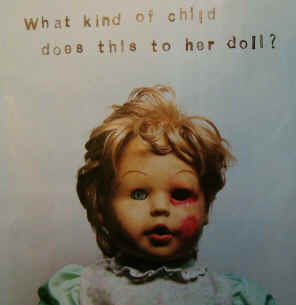 Notice of a conference on "Israel and the Occupied Territories"
A shock advertisement showing a doll belonging to Jessica, blood stained with one eye gouged out, asking, "What kind of child does this to her doll?" The advertisement seeks donations to assist children "unnecessarily injured by the conflict in the Middle East", which, as has already been made very clear, is the fault of Israel. That Christian Aid has a political, not a Christian agenda, was confirmed by a visit to its web site where even the "Worship" page made no reference to Christ or God. Some churches even bought the Christmas day worship pack offered by Christian aid and held a Christmas Day service all about Jessica from Bethlehem instead of Jesus born in Bethlehem! Christian Aid had appeared to mellow but this feature on Gaza shows nothing had changed. Same distortions and ignoring of facts; like the number of convoys actually allowed through and the building of a new shopping mall, hotels and an Olympic size swimming pool. A Christian is, by definition, one who follows Christ. Christian Aid News refers to the Guardian newspaper, a Liberal Democrat peer and a Quaker, but makes no mention of Christ or the Bible. Christ himself said that many will call him "Lord" and remind him of the things they did in his name but that he will say, "Depart from me you evil doers; I never knew you." Wildolive believes that Bible believing Christians would wish to reconsider their support for this organization, which is misguidedly seeking to subvert Christian worship into political activism in support of a corrupt regime with innocent blood on its hands. She was awarded the OBE by the Queen in the New Year’s Honours 2010, shortly after she lobbied MPs on behalf of the world’s poor. It is argued, in the UK, that charities must pay the going rate to get the good people - the same argument as used by the bankers. But statistic from the Telegraph on "paying the going rate" show how hollow this argument is! Not everyone is taking this lying down. Visit http://christianaidwatch.blogspot.com/ to see what can be done about the hold Christian Aid appears to have on many denominations, just by virtue of their name. 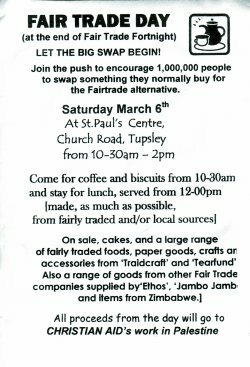 But did you realise it was set up by Christian Aid, among other NGOs and some churches are using proceeds from Fairtraid events to finance "Christian Aid's work in Palestine"
This handbill is for an event at a church in Hereford, UK. The Palestinian Authority (ex PLO) and Hamas in Gaza are both committed to ending the existence of Israel; it is in their charters. For Christmas 2007, the Amos trust was marketing its own Israel hatred propaganda products, including the olivewood nativity scene with a twist, a stomach churning anti-wall song in MP3 format and a pack for use in church at Christmas services. The Walled Nativity, A nativity set with a difference - this year the wise men won't get to the stable. Poignant, ironic and made in Bethlehem. - Prayers – some specifically on Bethlehem, as well as general prayers for justice peace, justice and even hope in a situation that is looking hopeless. All photos in the pack are available via email as high res. jpegs for use in services for slides or print. In some services maybe just one prayer will be read, in others campaigning action might be appropriate. Whatever you do, let's keep Bethlehem on the agenda this Christmas - not in a romantic way, but by raising awareness of the reality in the land that is no longer holy. Watch out for Garth Hewitt speaking or marketing worship items. World Vision is another charity that appeals to Christians to support its humanitarian work but which appears, judging by this issue of its magazine, to be campaigning against Israel and for what it perceives to be the rights of the Palestinians. - Shurat HaDin, the Israel Law Center, is threatening to sue World Vision Australia for allegedly indirectly dispensing over $1 million of Australian taxpayers' money to the Popular Front for the Liberation of Palestine through the Union of Agricultural Work Committees, a group that "was established by, is controlled by, shares assets with and operated in concert with the PFLP." This week Shurat HaDin handed "conclusive evidence" to World Vision with an ultimatum to either cease funding by October 15 or face legal action in the Federal Court of Australia for breaching the Charter of the United Nations Act. World Vision Australia, which distributes funds in Gaza from the government's foreign aid agency, denies the allegations. Amnesty International came into being to seek justice for the inmates of the Gulags of the former Soviet Union. Once that injustice was righted, they sought other targets to maintain their jobs, prestige and salaries. Taking up the (false) narrative of the Palestinians worked very well with their liberal followers. Amnesty International has recently stepped up several campaigns, including some against Israel. 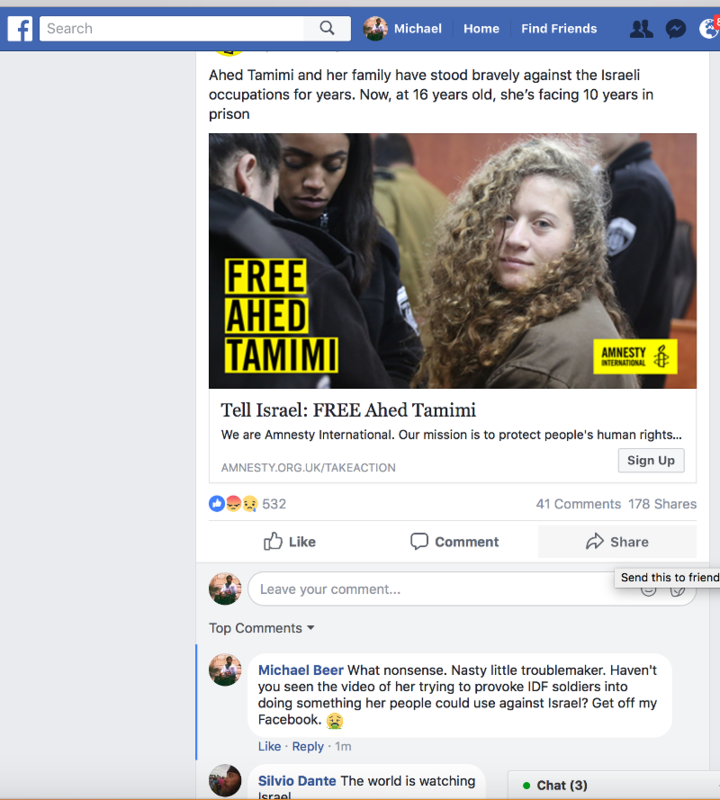 The latest is in support of Ahed Tamimi, a young Palestinian who specialises in trying to provoke IDF soldiers to react on camera to produce videos that can be used to blacken Israel. Video of her at work is available here and on YouTube. Why would a reputable charity take her side? In a ceremony celebrating its 150th anniversary, the International Red Cross together with the Palestinian Red Crescent planted 150 trees bearing the names of "veteran prisoners." The Palestinian Authority uses the term "veteran prisoners" to refer to those who have been in jail the longest, and in most cases are serving life sentences for murder or multiple murders. Giorgio Ferrario, representative of the International Federation of Red Cross and Red Crescent Societies, participated in this ceremony honoring terrorists, which was named "My Honor is My Freedom." Assertions that the barrier is ineffective and spiteful are unfounded. From the launch of the "Al Aksa Intifada" in summer 2000 until the strategic parts of the barrier were completed early in 2004, over 1000 Israelis were killed by Palestinian terrorists. After completion there were no successful terror attacks for around six months. Then another bus was bombed in Beer Sheva, which was still outside the protection of the barrier. yet protected. The Christian Socialist report is also one sided in its sympathies. Why is the right of the Palestinians to move around freely championed while the right of the Jews to go about their daily lives without being shot or blown to pieces is not even considered? Much is made of the Palestinians’ need to be able to get to their employment in Israel and of their economic hardship. But aren’t they seeking an independent Palestinian state? How can that state be viable if there is no work there? Where did all the EU and USA aid money go to? (more per capita than to any other place on the planet) Money which should have rebuilt the infrastructure of the Palestinian area? There is no condemnation of the culpability of the Palestinian leadership who initiated the terror war that caused the barrier to be built? The booklet visits many familiar arguments, but it should be borne in mind that, "he who defines the terms, controls the debate", and the terminology used is always that defined by the Palestinians. For example, the "Occupied Territories" which are actually Biblical Judea and Samaria and were part of the territory given to the Jews by the international community, and then occupied by Jordan in 1948. They are, at most, disputed territories. One needs to ask whether the Christian Socialists are Bible believing, born again followers of Jesus whose political beliefs are left of centre, or socialists, or even humanists, who are seeking to live according to the world’s perception of Christian ethics. Is the barrier in fact a barrier to peace? No; the barrier is a barrier to Palestinian violence. The violence is not because of the barrier - the barrier is because of the violence! The violence was there before the barrier. Wildolive has attempted a review of the different denominations and their attitude towards Israel. Denominations on Israel. Editor's note. It appears that the denomination of which I have been a part since my conversion in 1966, is leaning towards the Anti-Israel line. The Baptist Union of Great Britain bought into the "Decade to Overcome Violence" initiative. The campaigning agenda includes "Israel and Palestine", and links from the BUGB web site lead to one pushing the condemnation of Israel for the "Illegal Occupation of Palestine." Baptist Union of Great Britain Magazine - bugb Magazine, March-April 2009 issue carried an anti-Israel feature on three of its eight pages. Also, the Baptist Times published slanted, anti-Israel articles. The BMS magazine also devoted an issue to attacking Israel. I E-mailed a letter of complaint, pointing out the error of such a stance, to Baptist Union people. Perhaps some of the ideas may be helpful if you want to air your concerns within your denomination. This got me nowhere, but that should not stop us pursuing the truth. Baptists for Israel aims to unite Baptists in Great Britain who love Israel rather than following the Baptist Union position against Israel. - in whatever denomination it appears. A succession of Churches have, voted, in their governing assemblies, to withdraw all investment from companies who have trade arrangements involving Israel, and to promote boycott of all Israeli products. Apart from the fact that these moves will hit the Palestinians as hard as the Jews, these churches appear to be distancing themselves from God's blessings and inviting His cursing. The level of hatred for Israel in Church publications on Israel is staggering. A report on Israel produced by the United Methodist Church is "distorted and mendacious," the Anti-Defamation League has charged. The 225-page report, "Israel-Palestine: A 2007-2008 Mission Study," likens Jews to "monsters" and compares the actions of Israelis to Nazis, the group said. The group also criticized the report for using the word "terrorism" to describe Israeli actions, while the actions of Palestinian Arabs are described as "activism." In a statement, ADL officials called on the church to repudiate the report. The study "repeatedly twists history and employs inciteful language to denigrate Israel and Jews," the group's national director, Abraham Foxman, said in a statement. Church officials defended the study. "The United Methodist Church is not neutral on the question of military occupations," officials said in a statement. "The mission study's perspective is in keeping with the thoughtful, informed, and consistent position of the United Methodist Church on the occupation of Palestinian territories," read the statement, which was signed by the interim general secretary of the church's General Board of Global Ministries, Bishop Felton May, and the deputy general secretary of the Women's Division, Harriett Olson. *NOTE: Some material accompanying the cited report was available on UMC's Global Ministries website. 2004 - PCUSA voted to begin a process of "phased, selective divestment from companies operating in Israel. May 2008 - IN MAY of 2008, a remarkable document appeared on the PCUSA Web site entitled "Vigilance Against Anti-Jewish Ideas and Bias." While church members had already spoken on this topic with their votes in 2006, this document was the first response from the leadership of PCUSA to concerns (expressed by both Jews and significant numbers of Presbyterians) that church language and action regarding the Middle East was tarnished by incorrect or biased information, one-sided accusations, and even anti-Semitic theology. "we are aware and do confess that anti-Jewish attitudes can be found among us"
"anti-Jewish theology can unfortunately be found in connection with PC(USA) General Assembly overtures." "one finds characterizations of Zionism that distort that movement." "The problems and suffering of the Palestinian people are attributed solely - and inaccurately - to Zionism alone." Most significantly, the statement asked church members to reflect carefully on analysis of the Middle East delivered through the prism of "liberation theology," a reference to the work of those such as the Sabeel Ecumenical Liberation Theology Center. 'VIGILANCE AGAINST Anti-Jewish Ideas and Bias" was celebrated by the church's interfaith partners as well as by PCUSA's harshest internal critics. And then, with no fanfare, no announcement, without even an explanation, this document was quietly replaced by an "updated" version, one which stripped the work of any acknowledgement that the church continues, as it does, to traffic in retrograde theology and stances. Gone was direct acknowledgement of problems with the stands that the church is currently taking, and gone was the reference to Israel's sole responsibility for Palestinian suffering as being "inaccurate," replaced by broad generalizations and hints that criticism of PCUSA had more to do with misinterpretation of good intentions than with actual error. As one Internet critic put it: "It is as though a liberation theologian came upon the original paper, 'Vigilance against Anti-Jewish Ideas and Bias,' took out a pair of scissors and started hacking away at it." Are Presbyterians Rewriting The Bible To Remove References To Israel ? www.nowtheendbegins.com January 21, 2015 and others say they are. "This new version blatantly changes God’s Word. Any mention of Israel – gone." "Any mention of Jesus being a Jew – gone. " While it is true that Palestinian Liberation Theology uses Jesus (Yeshua) as a Palestinian Arab, there and that imagery depicting this has wide usage, there is no evidence of Presbyterians and Sabeel are producing a rewritten Bible. Such a story could be easily proved if such a Bible was to come on to the market, otherwise this story should be disregarded as dangerous to the cause of genuine biblical interpretation. Much Christian literature is tainted by Replacement Theology. Regular, sloppy, references to Jesus living in Palestine only serve to reinforce in people's minds the ownership claims made by the Palestinian Authority. The term "Palestine" was not coined until 70 CE to spite the Jews by reference to their enemies, the Philistines. (The Philistines were European, not Arab or even Semitic) The Palestinians did not assume that name until 1967, and are mostly Jordanian. One book entitled "Blood Brothers" by Elias Chacour (see below) is marketed as an inspiring story about Christian love. It was disappointing to find it is actually a very rosy picture of a childhood spent in the Galilee establishing that the Palestinians had been there since before Jesus came. This idyll is contrasted with the coming of the Israeli army. Admittedly, loving and understanding words are used about the Jewish enemy, but the book appears to rehearses all the Palestinian grievances against Israel but gloss over the Muslim persecution of Palestinian Christians and violence against Israel which causes ordinary Palestinians such misery. Christians reading this book, who didn't know better, might be inspired by the author's life, but would at the same time be absorbing the propaganda of the Palestinians who are actually seeking to destroy Jesus' race and take over God's Holy Land for Allah. Sabeel is a body of Palestinian Christians (only some; not all ) who hold to a Replacement Theologywhich they describe as an Ecumenical "Palestinian Liberation Theology", "nourished by the hopes, dreams and struggles of the Palestinian people." 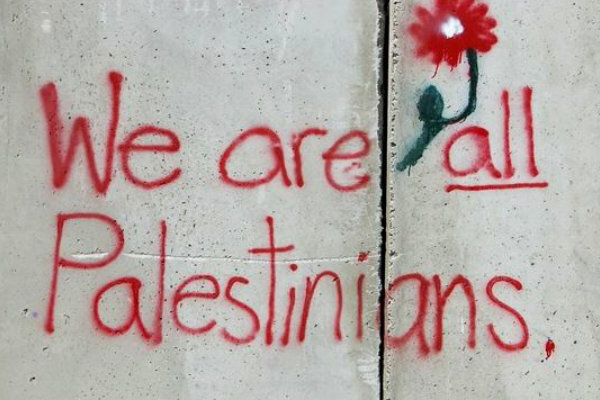 That is, seeking liberation from Israeli "occupation, violence, discrimination and human rights violations". This group appears to hold that anything leading towards the destruction of Israel is good. A very strange position for any Christian to hold about any nation; especially one quoting Matthew 5:9, "Blessed are the peacemakers...". Liberation Theology appears to say that Christians should always champion the underdog. In some situations this could be applicable, but the "underdog" is not necessarily in the right or worthy of being championed. Liberation Theology is effectively harnessed by the Palestinian activists by portraying Palestinians as underdogs, oppressed by the powerful Israelis, and calling upon Christians to fight their cause. Sadly, many Christians buy into this without noticing that the "Palestinians" how ever real the individual suffering of the chosen subjects, are actually the aggressors who are seeking to destroy Israel. Thus we see Christians siding with Islamic in its campaign against the people of our Lord Jesus. See how Jesus and his crucifixion are misappropriated to bring Christians on side with the Palestinian (Islamic) campaign against Israel and the Jews. Pax Christi is an international "Catholic Movement for Peace" which is respected by many for its work in "Israel/Palestine". Its international president is Michael Sabbah, who is mentioned in the book "Why I left Jihad" by Walid Shoebat, an ex Palestinian Terrorist, now a Christian and a lover of Israel and the Jews, in his discussion of Replacement Theology. Many organizations call for peace, yet in reality they support the utter destruction of the state of Israel. I have dealt with them face to face. Emil Salayta, who heads the Latin Patriarchate schools in Jerusalem, once spoke on "peace" at the Presbyterian Church in Walnut Creek, California. I attended and challenged him. "Could peace be achieved by bombing Israeli buses?" I asked. I have his answer on tape. "Israel must be eliminated, by whatever means," he replied. No one else seemed concerned. You may find the activities of local groups reported in your local newspaper, like the following. You might like to respond, and perhaps my efforts might encourage you. A HEREFORDSHIRE peace group has just returned from a fact-finding trip to the Middle East. The Palestine Support Group in the county is pressing for greater understanding between Palestinians and the Israelis in the disputed West Bank territories. Retired pathologist *******, college lecturer ******* and veteran peace campaigner ****** spent 10 days in the trouble-torn land. They visited hospitals and local groups working to bring an end to the fighting. "Since the death of Yassar Arafat, the Israeli forces seem to be taking a less hard line and there has been some improvement," said Mr *****. "I come from Northern Ireland and believe the way forward is for both parties to try harder to understand each other and work for peace." The ***** group has 20 members and works closely with the Diocese to promote peace. Note that this "peace group" is actually a pro Palestinian - anti-Israel group, called the "Palestine Support Group"
They go around Palestinian areas hearing their points of view and they seek out Jewish groups whose concern for the Palestinians they construe as identification with the objectives of Palestinian leaders. Who are these "local groups working to bring an end to the fighting" ? These groups are all locked into blaming Israel, and propagating the Palestinians' false claims about the Land being stolen by Israel. The only end to the fighting these groups envisage is the capitulation of Israel. The only peace the PA will accept is that which will follow the destruction of Israel and the Jews. Note the implication in "Since the death of Yassar Arafat, the Israeli forces seem to be taking a less hard line and there has been some improvement," Clearly, they maintain the situation was entirely due to the IDF, rather than the "Intifada" terror campaign launched in 2000 by Yasser Araffat. The group "works closely with the Diocese to promote peace", yet *** ***** (and possibly the others) is not a Christian but an Atheist. Why is diocese influenced by groups such as this? What balancing views does it get presented? Here is my response, which was published in the same paper. You may find good or bad points in it to encourage you to write to your local papers. Since your paper has carried two contributions from the Hereford Palestine Support Group, I should be grateful for the opportunity to point out that their view is but one side of a complex argument. I write as one who has visited Israel eight times since 1998 and met Jews and Arabs in various places, including Bethlehem and Jericho. There is a group of people in Hereford who understand the Israeli side of the argument. The fact that the "peace" group can quote Jewish concern for the problems experienced by the Palestinians surely demonstrates the caring nature of the Jewish Israelis which we have observed, as well as the freedom of expression which they enjoy. Whatever criticism of their leadership and its war against Israel that Arabs have expressed to us is seldom expressed publicly since those designated "collaborators" are publicly executed and mutilated in places like Manger Square in Bethlehem. The case against Israel is largely built on unsound terminology, such as "the occupied territories". These disputed territories were part of Israel, as created by the League of Nations / United Nations, but then occupied by Jordan in 1948 and retaken by Israel in 1967. Both wars were started by the Arab nations in order to destroy Israel. The word "Palestine" is used to suggest the existence of a nation or state which has been invaded and occupied, which again is not the case. Otherwise why is President Bush trying to create a Palestinian state? The arguments about the Security Barrier are also misleading, partly since less than 5% is actually a wall, but mainly by ignoring the reason for its existence. Between the start of Yasser Arafat's "Intifada" against Israel in Autumn of 2000 and the completion of the most strategic section of the barrier, nearly a thousand Israeli men women and children (out of a population of only 5.5 million) were killed by Palestinian terrorists who just walked or drove into Jewish areas to attack buses, cafes etc. Finally, whatever non faith-based groups and even many Christians may say, the Bible clearly states that God gave this little strip of land to Israel / the Jews and He still has plans to be completed there. God promised that Ishmael (the Arabs) would be a great people and He has been true to His word, since they have territory 620 times the size of Israel and rich in oil. We certainly desire peace in Israel, but it will not come by supporting the Palestine Authority/ PLO, a body which still has the destruction of Israel enshrined in its constitution. This produced a reply from a local Reverend gentleman. I FULLY agree with Michael Beer about the complexity of Israel and Palestine (June 23). Those who criticise Israeli policies must always bear in mind the appalling fruits of anti-semitism and recognise fully the generosity and freedoms of the Jewish people in Israel today. It is alt the more tragic that the Israeli government continues to perpetrate an immense injustice against the Palestinians, an injustice that continues to fuel hatred and fear on both sides. Several of Mr Beer's statements are misleading. The disputed territories were not allocated to the Jewish people alone. The UN was seeking some Kind of shared solution when Israel pre-empted the outcome. The wars of 1948 and 1967 were not the responsibility of the Arab governments alone. In 1948 there had been atrocities on both sides. The security barrier is an understandable defence against suicide bombers but it does not run along the cease-fire line but effectively annexes considerable portions of Arab territory. It is difficult to avoid the phrase 'the occupied territories'. The IDF is in military occupation of millions of Palestinians and has been for nearly 40 years. In that time 40% of the land has been visited on the people (well documented by Jewish human rights organisations) and the economy has been devastated. As for the Bible, it is a rich, helpful but very human set of documents. It cannot be called in to settle boundary disputes 3,000 years later. Do we try to justify what God said and did in the Bible to satisfy the world's ideas of what is nice? If God destroyed the wicked people of Canaan* and gave the land to the children of Israel, are we trying to deny that? And if God is determined to have Israel back in the land He promised them, are we to apologize and try to put a positive or acceptable "spin" what the Bible says? We need to remember that God has his own agenda which is much larger than being thought of as "nice" or "fair" by people who do not even accept His right to any say in their own lives. God described himself as "I am". He exists without reference to anyone else and does not have to justify Himself or His actions to anyone or any group. If you think God is "fair" in the childish sense perhaps you should read Matthew 20 verses 1-16. Have you ever pondered why some Jews are against Israel? Why they refuse to acknowledge any call to make aliyah? And why they have sympathy with Palestinians who are working towards the destruction of Israel? You could try complaining to the Charities Commission, ( in the UK ) but it will not take any action unless you can prove financial irregularity. They are not interested in the rightness of charities campaigns. As in previous years, NGOs and well-known charities exploited the 2012 Christmas season with anti-Israel campaigns. Groups such as Christian Aid (UK), Tear Fund, Kairos Palestine, Sabeel, War on Want (UK), Amos Trust, and Adalah-NY once again used theological themes to advance immoral anti-Israel campaigns and, in some cases, antisemitism.